Site Tracking is a powerful feature that connects your marketing and sales processes to your website activity. It allows ActiveCampaign to “see” and then “react” in real-time as contacts visit your site and view specific categories and pages. Site Tracking allows you to create marketing and sales processes that leverage behavioral targeting, triggered messages, and granular segmentation, all of which have proven to improve the contact experience and increase conversions. How is Site Tracking different than your analytics solution? How does Site Tracking work? Analytics solutions, such as Google Analytics, give you statistics about your website activity. It is aggregated data that is meant to identify trends and issues with your website. Site Tracking, on the other hand, gives you insight into what individual contacts are doing on your site. Beyond that, and most importantly, it allows you to automatically create personalized experiences for each of your contacts as they interact with your website. You can trigger a message with a coupon code to send 30 minutes after a contact views a product page of your site... but only if they didn't make a purchase. You can apply a tag to indicate a contact's interest and begin a targeted follow-up sequence after two or more visits to a specific product category. You can fork an automation so you treat a contact differently if they've already viewed a certain page of your site. You can have automations only begin if a contact has viewed a page of your site. You can automatically move contacts to another stage of your sales pipeline when they view 3 or more important pages of your website (such as your pricing, product, and demo pages). You can increase or decrease a contact or lead score on the basis of visits and views of specific pages. You can personalize the content of your campaigns based on what categories of your site a contact has repeatedly viewed (using Conditional Content). By combining Site Tracking data with other behavioral data (such as email campaign opens, link clicks, and form submits), you can accurately identify exactly what information and products are most important and interesting to each contact so you can target your cross-channel messages with content and offers you know appeal to them. This will increase the relevance of your messages beginning a positive feedback loop that ultimately leads to happier contacts and higher conversions. You place a small snippet of code into each page of your website so that page view data can be sent to your ActiveCampaign account. Site Tracking places a cookie that tracks page views. To associate page view data with a contact, a contact will need to be identified so that the site visits are linked to an email address. Note that Site Tracking is collecting anonymous page view data for all your site visitors, even before a contact is identified. However, only page view data collected after the identification of the contact will be shown on their contact profile page. When they click on a link in a campaign. When they submit a form created in ActiveCampaign. Note that if the form has double opt-in enabled, page views will not be tracked for visitors until they complete the opt-in process. We are not able to identify visitors who submit a third-party form. By dynamically inserting the email address of known visitors into the tracking code. See the section titled “How contacts are identified” below for more information. Site Tracking is quick and easy to set up. We recommend that everyone set up Site Tracking because it's a core feature that enables more powerful marketing and sales processes. 1. Click "Settings" located in the left menu. 2. 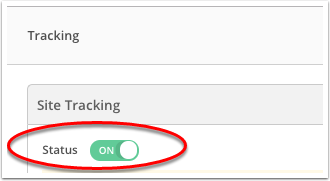 Click "Tracking" on the left side of the Settings page. 3. 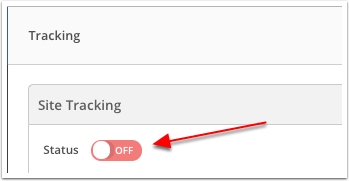 Under Site Tracking, click the red toggle to turn site tracking "On." 4. You'll see a section titled "Whitelist Your Website" and an option to add your website URL. In the text field, type your domain name (excluding the "http://") and click Add. Your domain will appear to indicate it's whitelisted. Add each of your domains (you can include the domains of multiple websites) and subdomains. Note that you are not required to include the "www" in the URL in order to whitelist it. 5. The Site Tracking and Conversations boxes will be checked by default for each domain you whitelist. The checked Conversations box means that the Conversations chat widget will appear on those pages. If you only wish to enable site tracking, you can uncheck the "Conversations" box. Note that in order to add the chat widget to your website, you'll need to enable the Conversations feature. Press Control + c (Command + C on a Mac) to copy the code to your clipboard. Press Control + v (Command + v on a Mac) to paste the code into your website. For Site Tracking to work, you need to paste the tracking code that we provide into each page of your website. In general, we recommend placing the code in the footer as this is the easiest way of having site tracking work on all pages. However, you will need to review the documentation provided by your Content Management System (CMS) to make sure the placement of the code is correct. In addition, they may provide a solution that allows you to only paste the code once, and have it display on all pages. Note that if you also have Conversations checked on the Tracking page, the chat widget will appear on every page that has site tracking code installed. If you are using a WordPress site, please see our WordPress plugin article. If this is too technical for you, note that you do not need to use this option—you can still identify contacts with form submits and link clicks. However, if you are technical enough, this is an additional option available to you. Once the code is in your site, and you've whitelisted your domains, ActiveCampaign will begin collecting data and adding it onto your contact records as contacts are identified. To read about Site Tracking and the GDPR, click here.